There is surely no more interesting day out in Leeds than a visit to the Thackray Museum, which tells the story of medical advances through the ages. A recreated Victorian street, complete with sights, sounds and smells, highlights the lives, ailments and treatment of a bygone era in vivid clarity, and visitors can also step inside the human body in an interactive gallery. 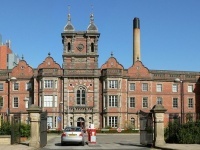 The museum was the vision of Paul Thackray, a former director of a medical supplies company, and since its opening in 1997 has become one of Britain's best museums as well as one of the largest medical museums in the UK.